Pinterest is now the must-use website in promoting content and having a presence online. I would say it is the logical middle-poin between Facebook and Twitter, but with a focus on images. Like Twitter, there is no real distinction between the normal user and a business like there is with Facebook, yet it functions more like Facebook, particularly the commenting system. It is less personal than Facebook, content can potentially spread to any user rather than from friend to friend. The biggest obstacle from a SEO point of view is that it is limited in that all that can be posted are images. So while images have always been important in making an interesting and unique website, from an SEO perspective images were only important insofar as they keep users interested in the page – the metadata of the image was far more important to Google, as far as its webcrawlers are concerned images may not exist! Pinterest reverses this as all content is image based, and like Google can draw massive traffic to websites through these images. To manipulate Pinterest we have to engage with the users who see these images, not with robots. And to engage we have to generate content. While cute pictures of cats may attract a certain user base, there are more pertinent things that can drive traffic toward our clients websites. Infographics are vital, a brief search for ‘SEO’ (here) brings up a goldmine of various interesting and attention-grabbing images. Their appeal is that they often present complicated data in an easy to read format, making the use of interesting graphics. The hope is the user is inspired to find out more by clicking the image and jumping to the host website. Of the millions of infographics on Pinterst you may expect some of these are quite uninformative and only superficial in interest, but several of them are certainly worthwhile. Click on them to enlarge, click on them again to go to the website, and a normal digital marketer can take it from there. Generating these initial clicks is the hard part. However, infographics may be overused. SEO MOZ half-jokingly points to making ‘instructographics’ because so many people have leapt on the bandwagon of making infographics. Not to say that they don’t work; it is just there is so much competition to have a presence on the frontpage of a relevant search that it is difficult to stand out. Instructographics could well be the next ‘big thing’ in terms of images, it is often difficult to tell because of the capricious nature of internet users. While SEO for Google is almost entirely driven by the words and links on webpages, getting prominence on Pinterest is user driven and image based. I feel this makes the platform unequal, as it is simply impossible for the average user to create the high quality images that Pinterest users demand, the average user is going to participate by sharing and commenting rather than by content-creation. High value content is going to be create by those who can afford it- the businesses. This infographic (they’re everywhere!) describes Pinterest image optimisation. The Pinterest results page for a search of ‘SEO’. Inludes many inforgaphics, as well as SEO clothing. Hmm. What can a small website do to join in with Pinterest? For starters the little “pin it” and “follow” buttons can join the ranks of the Facebook “like” button and the Google “+1” to drive users to link in with the website. In testimony to how powerful this can be, as far as I can tell Wired.com does not have their own Pinterest profile, yet they have a huge amount of content on Pinterest linked to them through pins and follows and can therefore generate great throughput to their site. High quality images are a must to promote content, and SEO techniques can be used to tag the images optimally, without resorting to keyword stuffing, which is of course a black hat practice. Getting users to follow you almost guarantees a presence on their Pinterest main page, so new content will immediately be displayed to them. I think one of the most significant aspects of Pinterest is how it is both an image site and a social site. To promote on Twitter, you have to gain an online presence and then post links to various interesting things you wish to promote. It is essentially the same for Facebook. With Pinterest, the content is already displayed to the user, clicking through to the website may be an afterthought. With Twitter you may make a link sound interesting but ultimately the user is going to have to click through to see if it really is. This could mean a high amount of hits but a very low conversion rate. 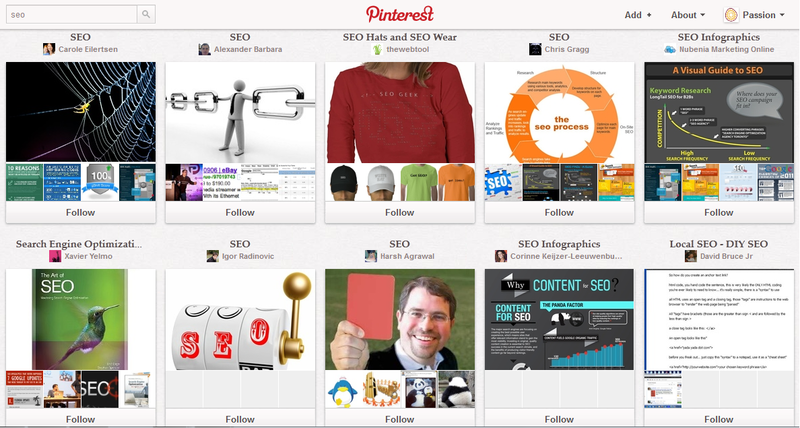 On Pinterest, the hits are going to be generated only if those crucial images generate interest. And as far as I can tell, that is all there is to it. Also be sure to check out our new Digitial Marketing Glossary. Also see our Passion Digital Pinterest page.